After a bit of experimenting with the boost::round functionality, the solution to the numeric instability problem was (of course) a lot simpler. The current implementation runs at 25 fps for a 600×600 resolution – pure software rendering. 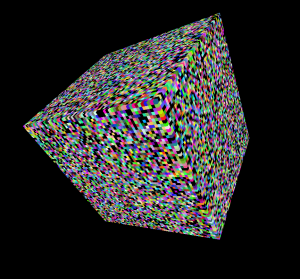 If you don’t know anything about volume rendering or voxels, what you can see here could give you an important insight: it’s interesting to see how a fundamental property of rendering discretized fields already shows: I used a 64x64x64 (that’s 262144 little cubes) data field for these renders. When I use a bigger field (128x128x128), this hardly impacts performance. A bigger chunk of memory must be allocated to hold the data, but that’s about it: we’re still shooting the same amount of rays. Compared to traditional methods, this is a difference. 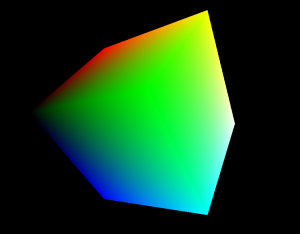 If you up the polygon count, this will have an impact on performance: there’s simply more items to check for intersections, more polygons to transform to screen space, … so all your loops will take longer to complete. If you’re somewhat underwhelmed by these pictures, remember that this is not a cube with textures applied to it. 2 Responses to "Voxel Renderer: got it right this time"
Curious why you’re going for a pure software renderer? Wouldn’t the massive parallelism in today’s GPUs help even if you’re ray-casting/marching/tracing voxels rather than rasterizing triangles? That said… I think I should do a pure software implementation first, too. Programming the GPU pipeline is such a … beach! That’s the next step, of course. I’m going for software mode now to have a stable basis on which I can test stuff which would be hard to implement on a GPU.